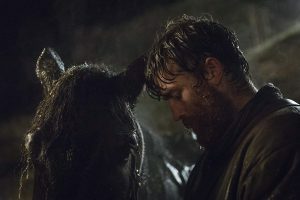 Set during the backdrop of the Great Famine, Black ’47 is not so much a spaghetti western as it is a ‘’potato’’ western. The story chronicles one man’s quest for revenge amidst the darkest hour of Ireland’s history. With the blight ravaging the crop, many Irish men are forced to swallow their pride and enlist in the British army and fight in their wars overseas to support themselves and their hungry families. Feenay (James Frecheville) an Irish ranger returning from Afghanistan to his sister Ellie (Sarah Greene) and her children, with a plan to immigrate to America. Feenay goes to pay his respects to his mother’s grave, but when he returns the constables and landlord evict Ellie and arrest Feenay when he intervenes, only to watch his nephew gunned down. Escaping his imprisonment, Feenay returns to find Ellie and her children dead of cold and hunger. With his particular set of skills, Feenay sets off to hunt down all those he holds responsible for his sister’s death, his nephew’s murder, for the famine itself, killing apathetic landlords, heartless judge and ministers who will only feed the starving if they convert. 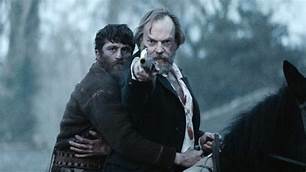 To curb Feenay’s killing spree, the British army recruits the ‘’Hunter’’ Hannah (Hugo Weaving), a disgraced veteran who served with Feenay, and is sent to find him as a stay of execution. Hannah is accompanied by British officer Pope (Freddie Fox) and private Hobbs (Barry Keoghan). The three track Feenay across the rural bog lands and steep roads, as Feenay closes in on his final target, Lord Kilmichael (Jim Broadbent). As they close in on Feenay, Hannah must choose between his loyalty to the Crown or his respect of Feenay. The historical setting further empathizes the bleakness of the future and a purveying sense of hopelessness. The final scene is open ended to between the choice of carrying on the fight to the bitter end or the possibility of starting over. Black ’47 is an important addition in Irish cinema, one that is ripe with the cultural, political ,religious and personal history of the land, and it’s made in honour of all those who died, left or never came back. This entry was posted in Blog and tagged irish famine on September 8, 2018 by SETV.